The airspeed indicator works by comparing dynamic pressure (ram air pressure) and static pressure. 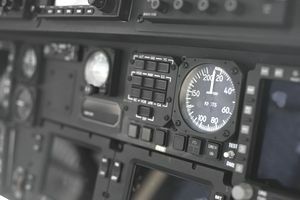 This article pertains to conventional airspeed instruments as opposed to newer computerized systems found on technologically advanced aircraft. Airspeed indications on modern, computerized primary flight displays depict airspeed differently than described in this article and are computed using modern sensor technology. Airspeed can also be obtained from a GPS unit in equipped aircraft. The airspeed indicator is part of the pitot-static system, a differential pressure system that measures both dynamic air pressure from the pitot tube and static pressure from a static port. Inside the casing of the instrument is a sealed diaphragm that receives both static and dynamic pressure from the pitot tube. Static pressure is also measured from inside the casing but outside of the diaphragm. The static pressures from both inside and outside of the diaphragm cancel each other out, leaving a measurement of total dynamic pressure, or ram air pressure. As the airplane accelerates, the dynamic pressure from the pitot tube increases, causing the diaphragm to expand. Through mechanical linkage, this measurement of increased airspeed is shown in the airspeed indicator needle. Indicated Airspeed: IAS is the airspeed read directly from the airspeed indicator. Calibrated Airspeed: CAS is the actual speed of the aircraft through the air, after being adjusted for position and instrument errors. The calibrated airspeed (as it compares to indicated airspeed) can be found in the aircraft's operating handbook. True Airspeed: TAS is calibrated (or equivalent) airspeed adjusted for nonstandard pressure and temperature. Equivalent Airspeed: EAS is calibrated airspeed adjusted for compressibility errors. Groundspeed: The actual speed of the airplane over the ground, measured in knots or miles per hour. Groundspeed is true airspeed corrected for the effects of wind and is useful when flight planning. Mach Number: The Mach number is the true airspeed of an aircraft as it is compared to the speed of sound. The speed of sound is known as Mach 1.0. High-speed aircraft have Mach meters instead of airspeed indicators. Small, single-engine airplanes use color-coded airspeed markings to help the pilot operate safely and efficiently. These markings are helpful because they depict crucial aircraft speeds, known as V-speeds. White Arc: The white arc on airspeed indicators depicts the normal flap operating range. Inside of the white arc, full flaps can be used. The top of the white arc indicates the highest speed at which flaps can be extended during flight, and operating at speeds outside of the white arc with flaps down can be unsafe. Green Arc: The green arc on an airspeed indicator represents the normal operating range of the airplane. Yellow Arc: The yellow arc is a cautionary range of airspeeds. It is advised that pilots only operate in the yellow arc in calm air. Flying at speeds in the caution range during turbulence can be unsafe. Red Line: At the top of the yellow arc is a red line, which represents the maximum allowable airspeed for the airplane. An airspeed indicator will be ineffective if there is a blockage of the pitot tube or static port or both. A blockage is most commonly the result of insects, water, or ice. If the pitot tube and its drain hole become blocked, the airspeed indicator acts like an altimeter, showing an increase in airspeed when the airplane climbs to a higher altitude and a decrease in airspeed during a descent. If the pitot tube becomes blocked and the drain hole remains open, the ram air pressure will bleed out through the drain hole, leaving only static pressure in the pitot tube. The new static pressure in the pitot tube would be equivalent to the static pressure from the static port, and the airspeed indicator would read "0." If the static port becomes blocked (but not the pitot tube), the airspeed indicator will work, but it will be inaccurate. Since the static air becomes trapped inside the casing at the altitude where the instrument stopped working, a climb will cause a lower than normal airspeed. When flying below the altitude at which the blockage occurred, the airspeed indicator will read higher than normal. Some airplanes are equipped with pitot tube heating elements. Pitot heat is used as a preventative measure to stop ice from forming over the pitot tube and is activated when flying in cold weather. Many small aircraft are equipped with an alternate static source that can be activated by pulling a lever in the cockpit in the event that a static port becomes blocked. The new alternate static pressure is a lower pressure than outside ambient pressure during flight, which results in slightly inaccurate instrument indications, but it provides a good enough indication to maintain positive aircraft control.